It is called a "showcase of aesthetic reflection" - the new pop-up store in downtown Los Angeles. It was designed by the New Yorker firm Snarkitecture for the swedish fashion retailer COS. The store concept is characterized by perfectly integrating itself into the look of the new COS collection. The architects followed the design of the new collection by creating the store concept. But not only the architecture is inspired by the fashion: the COS designers also cooperate with architects to be inspired by the way they reinterpret the core DNA of COS. The outcome is an inspiring eye-catcher. 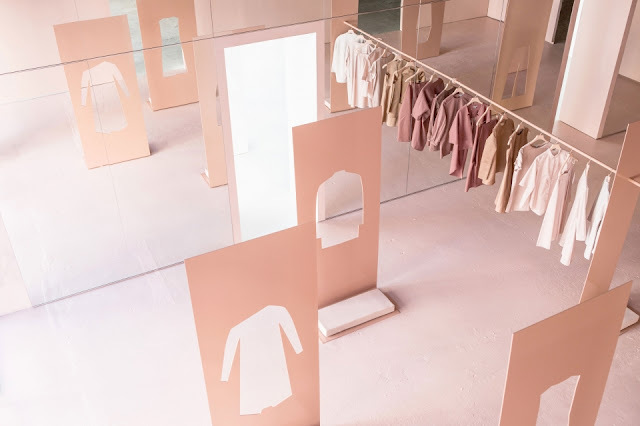 The fashion and the store concept absolutely complement one another, what is a totally new and interesting way to catch attention in the fashion industry.